The Gemstone Gully is a promnient gully located on the east face of Bridge Mountain. The name Gemstone is a play on words, Jen Stone was involved in the first Ascent of the Gemstone route. 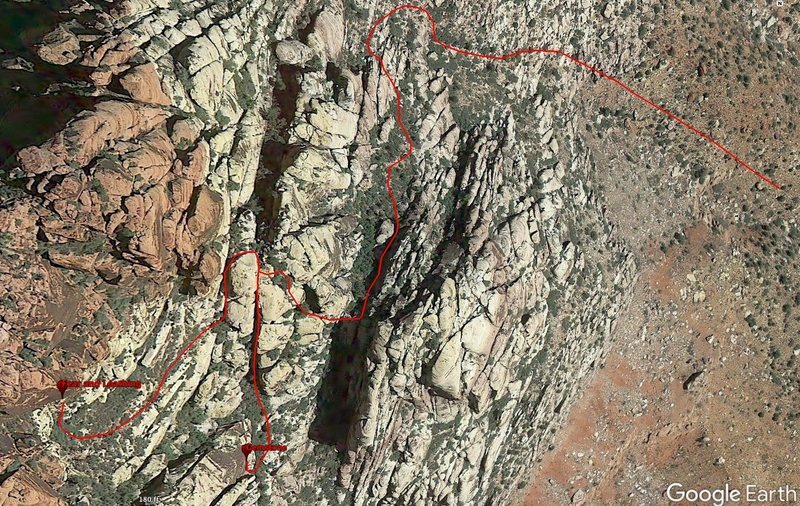 The Gemstone Gully house's at least 2 quality routes; Fear and Loathing and Gemstone. The approach for Gemstone Gully actually goes up a Spur ridge and then a side gully to the North. It involves some scranbling and some Bushwacking. Once you reach the notch between the approach gully and the Gemstone gully proper; you will go up or down Gemstone gully to get to the individual routes. See the pictures for more info on the approach. Two options exsist to descend from the upper reachs of the Gemstone Gully. Option #1 is to retrace your approach. Option #2 is to descend the Gemstone Gully. To descend the Gemstone Gully scramble down and do several rappells from trees. The longest of which currently requires 2 ropes, but could be done with a single 70M and not to much trickery. The long rappell is off a tree on the left(climbers) side of the large dry water fall in the middle of the gully. It is slightly exposed getting to the tree. The long Rappel descend teh Gemstone gully. Redline shows the Gemstone Gully. Josh Thompson has posted a good photo of the approach gully on the Fear and Loathing route page. Note that to access the approach gully, one must climb up the main wash past it slightly, then traverse back left across some ribs of pink rock to get into the bottom of the approach gully as pictured. This is usually well-cairned.